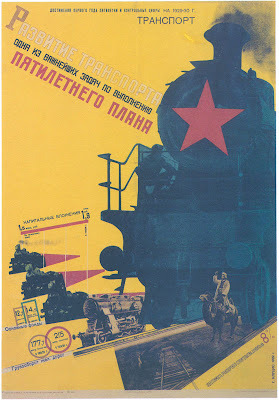 The Development of Transportation, The Five-Year Plan. 1929. Klucis is best known for his photomontages, claiming to having invented the sub-genre of political photomontage in 1918. He created energetic compositions, manipulating the scale and space of his subject matter while skewing perspectives; it is clear why his work holds a timeless modern appeal. My personal favorite image within the composition is the woman on camel-back waving, seen in the bottom right.